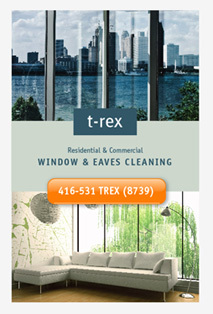 T-Rex Windows & Eaves Cleaning Ltd.
Services for both Residential & Commercial. The only GTA window company at the 2009 Fall Home Show. Come and See Us for Fall Promotions and Contests Only Available at our Home Show Booth! * Not to be combined with any other offer, discount applicable to all services except Eavestrough Replacement and Leaf Strainer Installation. Home Show flyer must be mentioned at time of call, and must bear the 2009 Fall Home Show logo. Offer must be used within one year of the 2009 Fall Home Show.